(CBS/AP) VATICAN CITY - The Vatican on Monday sharply criticized a book on sexuality written by a prominent American nun, saying it contradicted church teaching on issues like masturbation, homosexuality and marriage and that its author had a "defective understanding" of Catholic theology. The Vatican's orthodoxy office said the book, "Just Love: A Framework for Christian Sexual Ethics" by Sister Margaret Farley, a member of the Sisters of Mercy religious order and emeritus professor of Christian ethics at Yale Divinity School, posed "grave harm" to the faithful. The Congregation for the Doctrine of the Faith said that in the 2006 book, Farley either ignored church teaching on core issues of human sexuality or treated it as merely one opinion among many. Farley said Monday she never intended the book to reflect current official Catholic teaching. Rather, she said, she wrote it to explore sexuality via various religious traditions, theological resources and human experience. The Farley critique, signed by the American head of the congregation, Cardinal William Levada, comes amid the Vatican's recent crackdown on the largest umbrella group of American sisters. The Vatican last month essentially imposed martial law on the Leadership Conference of Women Religious, accusing it of undermining church teaching and imposing certain "radical feminist themes" that were incompatible with Catholicism. Video: Vatican accuses nuns group of "radical feminism"
It ordered a full-scale overhaul of the group and appointed three bishops to carry it out. The crackdown on Farley, a top American theologian, will likely fuel greater resentment at Rome among more liberal-minded American sisters. The Vatican examination of the book began in 2010 and involved seeking Farley's responses to its concerns. After her replies failed to satisfy the Congregation, it moved to a full-fledged "examination in cases of urgency" that concluded Dec. 14. Pope Benedict XVI approved the decision last March and ordered the decision published. In its statement, the Vatican singled out specific problems in Farley's book which it said "affirms positions that are in direct contradiction with Catholic teaching in the field of sexual morality." Farley, for example, writes that masturbation doesn't raise any moral problems and can actually help relationships rather than hinder them. The Vatican asserted that according to church teaching "masturbation is an intrinsically and gravely disordered action." Farley wrote that homosexual people as well as their activities should be respected. Church teaching holds that gays should be respected but that homosexual acts are "intrinsically disordered." On gay marriage, Farley said legal recognition of gay marriage can help transform the stigmatization of gays. Levada wrote back that approving gay marriage would not only signal approval of "deviant behavior" but would obscure the value of traditional marriage between man and woman in society. "The principles of respect and non-discrimination cannot be invoked to support legal recognition of homosexual unions," he wrote. In her statement, Farley said she had aimed to propose a framework for sexual ethics that "uses a criteria of justice" in evaluating sexual relations. She acknowledged that her responses to certain issues do depart from traditional doctrine, but said they nonetheless were coherent in theological and moral traditions. "The fact that Christians (and others) have achieved new knowledge and deeper understanding of human embodiment and sexuality seems to require that we at least examine the possibility of development in sexual ethics," she wrote. She said she appreciated the Vatican's work but lamented that her positions weren't reflected in the Congregation's final document. The Rev. James Martin, a liberal-leaning Jesuit author, said the notification will sadden many Catholic theologians who consider Farley a mentor. "It will also, inevitably, raise strong emotions among those who already feel buffeted by the Vatican's Apostolic Visitation of Catholic sisters in the U.S., and its intervention into the LCWR," said Martin, who has been a vocal supporter of U.S. sisters since the Vatican crackdown. Farley has received 11 honorary degrees over her lifetime, is a past president of the Society of Christian Ethics and the Catholic Theological Society of America, and won an award in 2008 for "Just Love." That said, Farley doesn't identify herself as a member of the Sisters of Mercy on either her official Yale biography or on the book's cover. The Vatican criticism, while seemingly harsh, is rather tame. It's not a formal censure of Farley herself, but just the book. And given that Farley doesn't teach at a Catholic university, the Vatican couldn't forbid her from teaching as it has done with other Catholic theologians who don't toe the Vatican line. But the Vatican did seem indirectly to hold Farley's superiors to blame for having allowed her to voice such positions that are so contrary to church doctrine. The Vatican notification said it was saddened that a "member of an institute of consecrated life" would do such a thing. 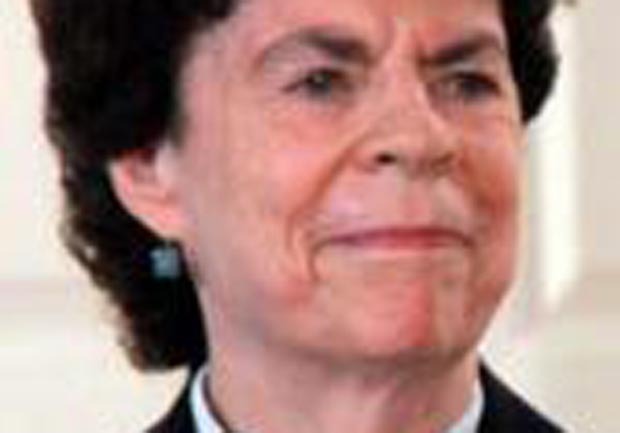 Farley's superior, Sister Pat McDermott, defended Farley and said she was deeply saddened that the Vatican had criticized "the significant pastoral and ethnical thinking that are represented in her book."